A trip to Africa graces the top of many travel-lovers bucket lists — and for good reason. While its best known for being the world’s greatest safari destination, its all-around diversity is next to none. Africa boasts exceptionally diverse and scenic landscapes — think rugged coastlines and tropical rainforests to dramatic mountain ranges and crimson sand desert; its winelands are famed for both its fine wine and stellar culinary reputation; and its boutique accommodation offering is one of the best in the world. If a trip to the world's second largest continent is in your sights to experience its unrivalled wildlife, rich traditions and to spot the “Big Five” (lion, leopard, buffalo, elephant and rhino), here’s where to book to guarantee one of your most memorable escapes to date. 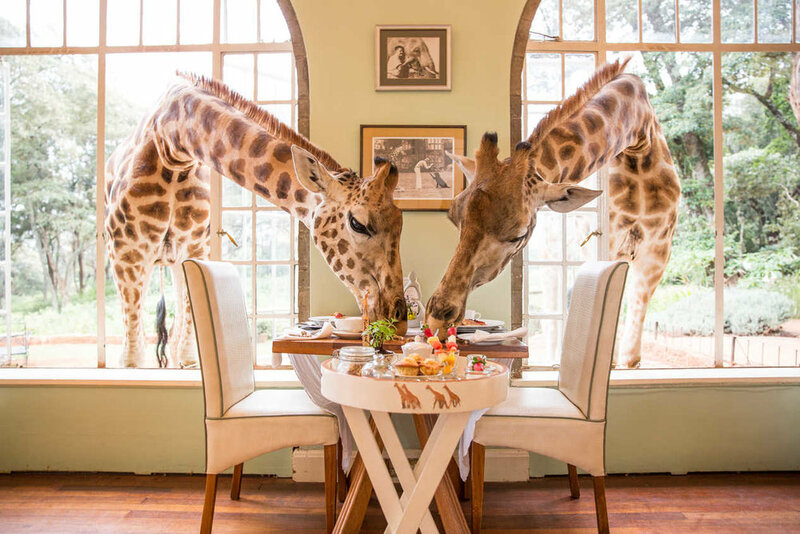 If you want a true once-in-a-lifetime travel experience, you can’t go past Giraffe Manor — especially if you’ve ever dreamt of sharing a meal with a giraffe. As its name suggests, Giraffe Manor is home to a herd of resident Rothschild’s giraffe who often visit the hotel during meal times, sometimes poking their long necks into the windows in the hope of a treat before retreating to their forest sanctuary. Giraffe Manor is owned by The Safari Collection and is an exclusive boutique hotel, set in 12 acres of private land within 140 acres of indigenous forest in the Langata suburb of Nairobi. With its stately façade, elegant interior, verdant green gardens and sun-drenched terraces, you’d be forgiven for thinking you had walked onto the set of Out of Africa. And of course, one of its twelve rooms is named after the famous film’s author Karen Blixen. For the ultimate safari experience, Luxury Safari Lodges could be just for you. Located in Kenya — the original destination for safaris and African explorations — Luxury Safari Lodges offer hosted safari guides with the Maasai people on the country’s most exclusive private reserves. The eco, award-winning camps are owner-managed and pride themselves on exceptional service. If you’re looking for an authentic safari experience that offers a glimpse of an old-world, untampered Africa, look no further. Lewa Wildlife Conservancy serves as a safe refuge for the critically endangered black rhino and the endangered Grevy’s zebra, as well as the elephant, lion, giraffe, wild dog and other iconic wildlife species in Kenya — including more than 400 species of birds. The Lewa landscape offers guests an unforgettable trip with its combination of breath-taking scenery, superb game viewing, excellent hospitality and conservation education. What’s more, not only is Lewa committed to the country’s wildlife and anti-poaching operations, but also its communities by investing heavily in the livelihoods of its neighbours through programmes in education, healthcare, water, micro-enterprise and youth empowerment. If you’re interested in contributing to wildlife conservation and community development, Lewa is the place for you. In 2002, the Grumeti Community and Wildlife Conservation Fund, a not-for-profit organisation, was granted the right to manage and conserve 350,000 acres of land for the benefit of Tanzania, Africa and the world. Four years later, Singita took over the management of the property to enhance low impact, luxury tourism in the area. Today, Singita Grumeti Reserves consists of two exceptional lodges on one unforgettable camp and its mission is to create the best private bush experience for its guests by combining low-density tourism with high-density game. Fact: Singita Grumeti’s safari experience is strong. Dubbed “the jewel of the Cape Winelands”, Delaire Graff Estate is a world-leading destination for wine, art and hospitality in a picturesque setting that was designed with the discerning global traveller in mind. It’s here that Cape Dutch architecture meets African artefacts and styling, and where exceptional levels of luxury and service create the ultimate escape. For the art aficionados, you can admire the personal art collection of the hotel’s founder, Laurence Graff, who is frequently named one of the world’s top art collectors along with some of South Africa’s finest contemporary artists. If you love wine, art and extraordinary scenery, Delaire Graff Estate will have your heart. Babylonstoren is one of the oldest Cape Dutch farms in the world. Located in Franschoek, Babylonstoren is a feast for the senses. Dating back to 1692, the fortunes of this historic fruit and wine farm took a turn ten years ago when it fell under the gaze of former magazine editor Karen Roos. Her passion for historic Cape Dutch style led to an authentic yet contemporary restoration that has projected the farm into the future. It’s now been transformed into a destination that you won’t have to — and won’t want to — leave. It’s home to charming farmhouse cottage accommodation, a farm-to-fork restaurant, a bakery which offers fresh bread by day and family-style dinner by night, a greenhouse which offers guests a wonderful refreshment station after their walk through the majestic garden, a luxury spa, a cellar door and a healing garden where you can slow down and blend herbal teas as guided by our gardener. This is a stay you won’t forget soon. Franschhoek in South Africa’s Western Cape is best known for its centuries-old vineyards and Cape Dutch architecture — and boutique hotel La Residence captures both. Located in the beautiful Franschhoek Valley on a private 30 acre estate filled with vines, fruit trees, flowers and herbs, La Residence sets the benchmark for luxury accommodation in the Cape Winelands. It’s here that the beauty compares both outside and in. Outside, you can indulge in a tranquil vineyard setting from your private terraces and gardens, and inside, you can appreciate the romantic interiors that are filled with rich fabrics, vibrant colour schemes and antique furniture. It’s spot on Conde Nast Traveler’s Gold List for 2018 was more than well deserved. Perched on the cliffs of South Africa’s capital city of Cape town, Cape View Clifton is undoubtedly one of the city’s most exclusive stays. The Smith Hotels property is a chic cliffside retreat above Cape Town's best beaches boasting uninterrupted views of Cape Town’s iconic Clifton and Camps Bay coast line. The seven elegantly appointed, expansive suites are decorated in calm-inducing hues and peppered with subtle colonial touches and modern artworks. Located just a short stroll to the city’s top restaurants, must-see sights and picture-perfect beaches, Cape View Clifton is a true gem.